After fifteen years of service with Air Contractors, the last DHL A300-B4 flight operated from Basel to Leipzig on Friday 28th June. After fifteen years of service with Air Contractors, the last DHL A300­‐B4 flight operated from Basel to Leipzig on Friday 28th June. EI-­‐SAF entered service with Eastern Airlines in 1982 and has been in service with Air Contractors and DHL since 2001. In total Air Contractors operated a fleet of sixteen different A300­‐B4s. This flight also marked the end of an era of jet aircraft operated with Flight Engineers. 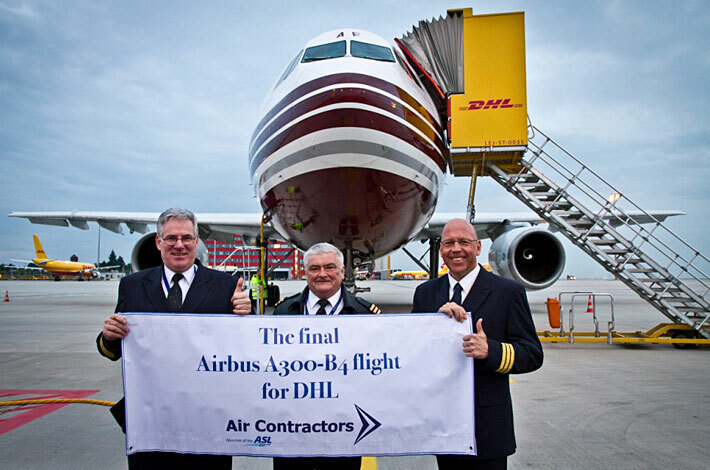 Air Contractors continues to operate the successor to the B4, the A300-­600 for DHL in Hong Kong.